Litmus, are the UK’s premiere Hawkwind inspired space rock band. This is the band second full length CD and shows that band playing harder and faster than every with an occasionally DOOMY touch to the music. Great spaced out synthesizers add a nice touch. This is very intense stuff and the band pretty much blow you away with their intensity for the first two tracks before getting a bit more spaced out and slowing down the pace with Lost Stations (reminds a bit of Assault and Battery). Under the Sign begins with quite aggressive space rock riffing before cooling off but remains a very intense 14 min track with a long jam. Planetfall is a short more laid back piece after the massive Under the Sign track. Psychotic Projection is another really high paced track and one of the more intense in your face tracks. Singularity keeps the aural onslaught going and is quite psychedelic with massive freaked out waves of synths attacking from all sides… Helios is a short synth based piece to give the ears and mind a break before the band kicks into the long 17 minute Expanding Universe track. This track has some heavy more doomy guitars (probably what Lee Dorin liked!) and in the middle section slowly builds up with tension and then explodes… The Machine Age picks up the high speed space rock once again and blasts you out into the galaxy once again. Very intense drums… Far Beyond does not let up either and blazes a path out into the unknown. The CD ends with Planetfall/S.E.T.I. This is a very very intense 76mins of music.. I am guessing too much for most people.. If you like high energy space rock, this is for sure your deal. Jeeeeeez, these guys just keep getting better all the time. 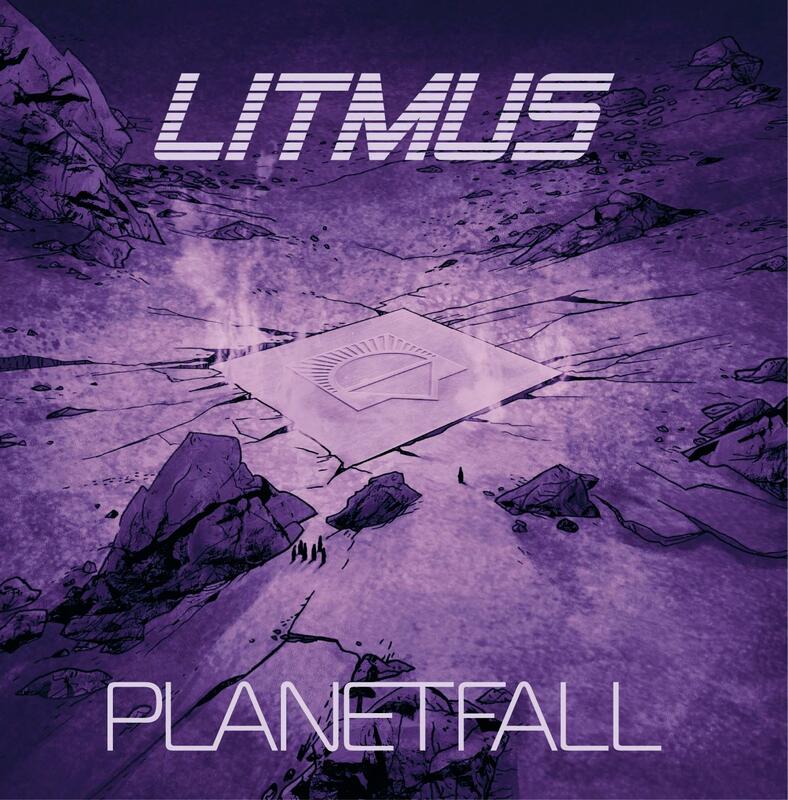 Planetfall is the second album from UK based Litmus (there were a couple private released cassettes before that), and while it's stylistically right in line with their 2004 debut, the band are tighter and the album flows seamlessly from one track to the next. That is, while each track is a stand-alone song, they're all stitched together so that one leads right to the next, making for a genuine ALBUM experience. Anyway, this is a real fasten-your-seatbelts adventure. Heavy… hard driving… punky, metallic SPACE ROCK. Yes, Space Rockers… strange visitors from another planet with powers far beyond those of mortal men. Hawkwind on steroids and blasting into space with a wild eyed damn-the-torpedoes attitude. There are a dozen tracks (a full 76 minutes) and rather than step through them all, suffice it to say that this is some of the hottest and heaviest rock 'n rolling space rock you could hope for, and played by a skilled unit that has clearly been working hard to hone their craft. I will, however, dwell for a moment on the two lengthy tracks, "Under the Sign" and "Expanding Universe". "Under the Sign" begins with metallic riffs, wildly dancing and screaming space synths, and vocals. But at 15 minutes you know there's going to be some serious jamming and indeed there is. In fact, they get right into the instrumental stretch-out bits pretty quickly and it's the most overtly Hawkwind sounding part of album. The total space rock jam bliss goes on for a while until the last minutes when they return to the song and wind things down with some cool sludgy metal riffage, only to rocket back into rock 'n rolling space for the song's last moments. "Expanding Universe" is easier paced, yet still quite heavy, combining chunky metal guitar riffs, UFO synths and proggy mellotron. But of course the band transition quite a bit throughout this 17 minute track. It's not as in-yer-face as most of the album, but I loved the buildup segments that culminate in molten rocking. Oy… listening to this album from start to finish just drains me. It's THAT powerful. Though the last track, "Planetfall/Seti", is a mercifully peaceful touchdown after such a blistering set. I've kept it in my car CD player a lot lately and blasting it while running around on my lunch hour pumps me up for the afternoon at my day job. HIGHEST recommendation!